Khormaei, F. (2015). The comparison of patience components among patients with major depression, generalized anxiety disorder and normal individuals. International Journal of Behavioral Sciences, 9(1), 77-84. Farhad Khormaei. "The comparison of patience components among patients with major depression, generalized anxiety disorder and normal individuals". 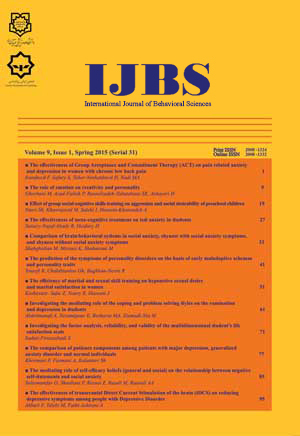 International Journal of Behavioral Sciences, 9, 1, 2015, 77-84. Khormaei, F. (2015). 'The comparison of patience components among patients with major depression, generalized anxiety disorder and normal individuals', International Journal of Behavioral Sciences, 9(1), pp. 77-84. Khormaei, F. The comparison of patience components among patients with major depression, generalized anxiety disorder and normal individuals. International Journal of Behavioral Sciences, 2015; 9(1): 77-84. Introduction: Patience is the most moral construct that is emphasized in the holy Quran and has a significant role in promoting mental and physical health. The aim of the present study was to compare patience components (Transcendence, Tolerance, Consent, Persistence, Delay) among patients with major depression, generalized anxiety disorder and normal individuals.Method: depression disorder and generalized anxiety disorder. Thirty patients with MDD, 30 patients with GAD and 30 normal individuals were recruited among them via an available sampling method. Moreover, the three groups were matched on the basis of age, gender and lack of medical and other mental diseases. Participants completed Beck Depression Inventory (BDI- II), Speilberger State – Trait Anxiety Inventory (STAI) and the Patience Scale.Results: The results indicated that there were significant differences between the three groups with regards to the components of patience. In other words, anxious individuals in comparison with depressed and normal individuals got higher scores in the component of Transcendence. Moreover, normal individuals compared to anxious and depressed individuals got higher scores in the component of Tolerance. Normal individuals also got higher scores in the component of Consent compared to the two groups. Depressed and anxious individuals in comparison with normal individuals got higher scores in the component of Persistence. Finally, the depressed group compared to the normal group showed higher scores in the component of Delay.Conclusion: It can be concluded that applying patience components in the treatment of depressed and anxious patients is necessary.